There’s been a silent battle going on in the toothbrush aisle for many years now. That battle is between the basic, familiar manual toothbrushes and the newer, more advanced electric toothbrushes. You may have already spent a lot of time looking back and forth between your hands – manual in one, electric in the other – but which is really better? Looking at manual toothbrushes, the obvious pros to them are the low cost, easy availability, and variety of styles available. There are many different colors to pick from, as well as soft or medium bristles, and smaller or larger heads. They are also very easy to travel with and you don’t have to worry about buying new batteries or charging them ever. So, in the end, the main pro to the manual toothbrush is convenience. Electric toothbrushes are generally argued to be the best for your oral health. It’s true that they are more expensive; however, buying a rechargeable toothbrush is generally a one-time high cost and then buying replacement heads is a comparable price to that of manual toothbrushes. They may also be more difficult to travel with; in fact, we recommend not travelling with them but instead having a manual toothbrush stock aside for this (those free ones from your dentist make a great stock pile for travel!). Now, the pros for electric toothbrushes: they make it easy to practice proper brushing technique, they do a better job of removing plaque, and kids usually find them more fun to use! Studies have shown that electric toothbrushes are more effective against removing plaque and reducing gum problems. 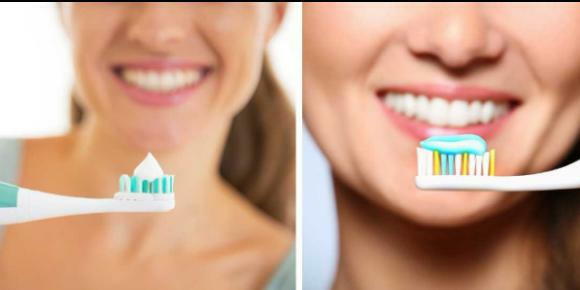 The rotating brush heads on electric toothbrushes allow the user to simply run the toothbrush gently across their teeth and let the brush do all the work for them. This is great since many people do not actually know the proper brushing techniques needed to keep your mouth healthy. Another plus is that many electric toothbrushes now feature timers. The majority of people do not brush for the recommended two to three minutes needed and this feature can stop the guessing games! Finally, kids may actually begin to look forward to brushing their teeth if they have a “fancy” toothbrush. Using an electric toothbrush means less work for them and some toothbrushes will even play music to time your kids as the brush; they just keep brushing until the music stops. Also, many kids say that the rotating toothbrush tickles their teeth! If you’re in the market for a new brush, it may be a good idea to make the switch to an electric toothbrush. If you do, however, prefer the good old manual brush, then just make sure that you practice proper brushing techniques.